The Dominion Energy Transmission Inc. Headquarters in Bridgeport W.Va. is proud to be the temporary host to 13 very special quilts on display this week in its lobby. These handmade, Americana displays were created by members of WV Quilters Inc. and the Daughters of the American Revolution using materials purchased through a $1,500 grant from the Dominion Energy Charitable Foundation. 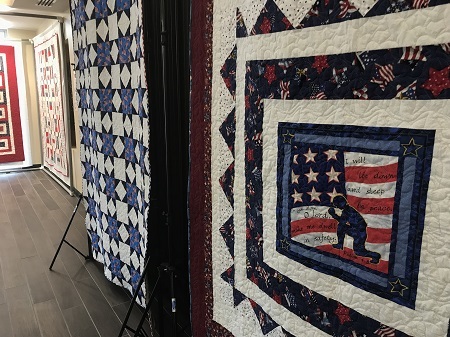 These quilts will be given to the Appalachian Wounded Warriors Camp in Valley Head, W.Va. for use on beds where area veterans will retreat in a relaxing setting and receive recognition for their sacrifice. Championing this cause, WV Quilter’s Inc. and the Daughters of the American Revolution rallied quilters from W.Va., Fl., and Oh. to honor and comfort the many veterans using this W.Va. facility each year.